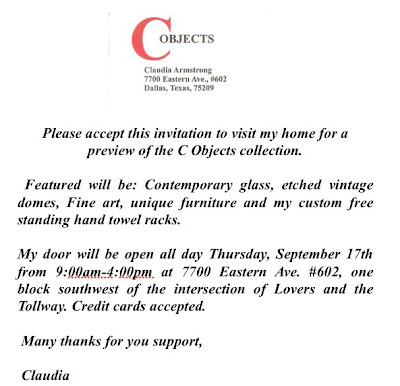 Claudia Armstrong, formerly of Forty Five Ten and At My Table, has gathered some of her talented friends for a not-to-be-missed sale out of her house. Armstrong is selling some of the things she's gathered on buying trips recently, and her friends are bringing more. Designer Jeffrey Swiggart will be selling some mid-century era outdoor furniture among other things. Armstrong is working on securing a warehouse space on Commerce St., east of downtown, where she'll open up shop sometime around the holidays. Meanwhile, she'll be holding periodic sales at home. I ran by and took a few shots last weekend while she was setting up some of the pieces in her University Park condo. This 60 x 33 giclee print is by Dallas artist Michael Osbaldesten. It's going for $600, a steal. Claudia will have other large scale prints by the same artist on the day of the sale. These 60s or 70s era brass skewers make great table ornaments, and will be priced for very little, Armstrong promises. You can really see Claudia's taste through the types of things she buys. Same with the golden beaded bird. There's a pair, and they'd look good just sitting on a table, Armstrong says. If you have a few bucks, they're yours. These etched glass lantern domes from Europe are more than 50 years old, and just look fantastic as table decorations, especially arranged in a group. They'll be going for $85 each. Claudia has a Lucite fabricator who makes these wonderful Lucite towel racks for her from vintage and antique architectural fragments she has found. They will go for $225 - $300. I love the old horse, he looks Etruscan. This marble fragment is my favorite. The wooden one behind it is made from an antique wooden Italian candlestick. These etched glass candle holders and lamps will be for sale also (sorry I don't have the prices for you). What I've shown here is just a preview, there will be a lot more for sale, so don't miss out. 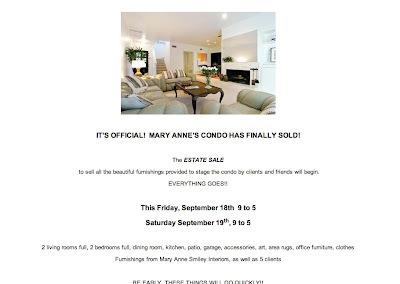 Designer Mary Anne Smiley is having an estate sale! Take a look at her invitation below (you'll have to click on it to read it). This is straight from Mary Anne about what's included in the sale: "An Italian Leather vintage Mid C 3 piece living room set is so good looking and very comfortable. There is a beautiful wood dining room table, 10 coral Chinese Fret Bamboo design dining room chairs with Dedar Black and White Seats. There is a beautiful coral Bokhara rug, a large Stark area rug, an Oriental, several runners, There are some beautiful art glass pieces, one from the 70s. There are 2 marble top night stands, a vintage bamboo patio set with bar, settee, chairs, Amoeba table, and end tables from the 40s that is so cute. There is a heavy Iron scroll table built in the 50’s with a thick round parquet wood top that is good looking. 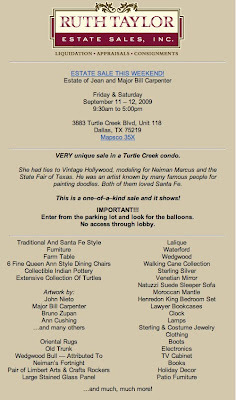 There are sconces, art, accessories etc.,"
Jean Carpenter died recently leaving an estate full of New Mexico and India artifacts, as well as some mid-century pieces. Check out the sale notice below (click on it to read it). 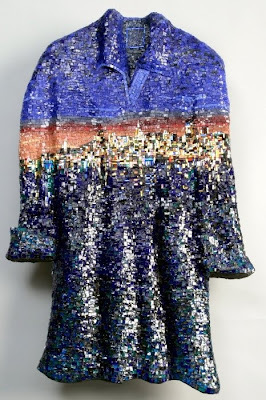 The 2009 Orsoni Prize, the International Award for Mosaic Fine Art, goes to Irving based mosaic artist Julie Richey. 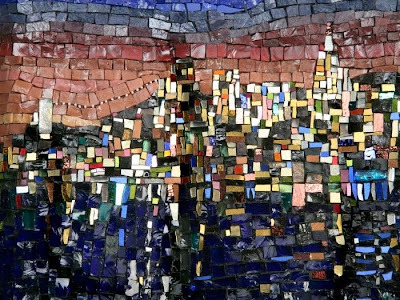 She does amazing mosaic installations for residences as well as her fine art. Detail of the Night Shirt. 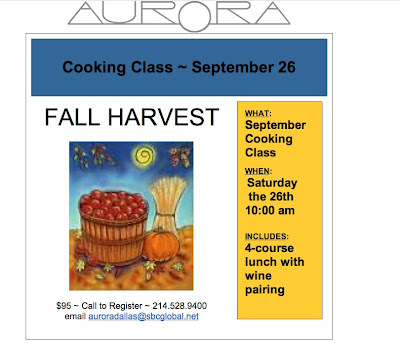 Chef Avner Samuel of Aurora holds a cooking class about once a month on a Saturday morning. I attended recently and shot some photos -- the whole experience was a blast, and I'd recommend it to anyone who's a fan of Samuel's cooking, or who doesn't want to pay the price of an expensive meal at Aurora. I love beautiful restaurant kitchens, so this one was fun to shoot. It costs $95 per person, and you get a 4-course meal paired with wines along with your lesson. You can't beat that. On this particular Saturday, it was standing room only -- the kitchen was packed and so was half the dining room, with many of us peering over the counter while Samuel did his magic. Most of the people at my table had never had a meal at Aurora before, and many of them had given the cooking class as a birthday gift. A few people were in town for a wedding and spent the afternoon cooking instead of shopping, they told me.